St. Patrick’s Day is just a few days away, so I made us this Dark Chocolate Irish Whiskey Tart to celebrate! It’s vegan, grain-free and a little boozy! Can you believe it’s the middle of March already, and spring and Easter are just right around the corner? I hate to wish my time away, but I’m pretty happy winter is almost over. I say almost, because an April snowstorm in Newfoundland is not out of the question! So about Paddy’s Day….do you celebrate, and if so, what do you usually do? Paddy’s Day is actually pretty big in Newfoundland, so we usually have a get together of some sort to celebrate. Nothing too rowdy! Just an excuse to enjoy some good eats and a few beverages. 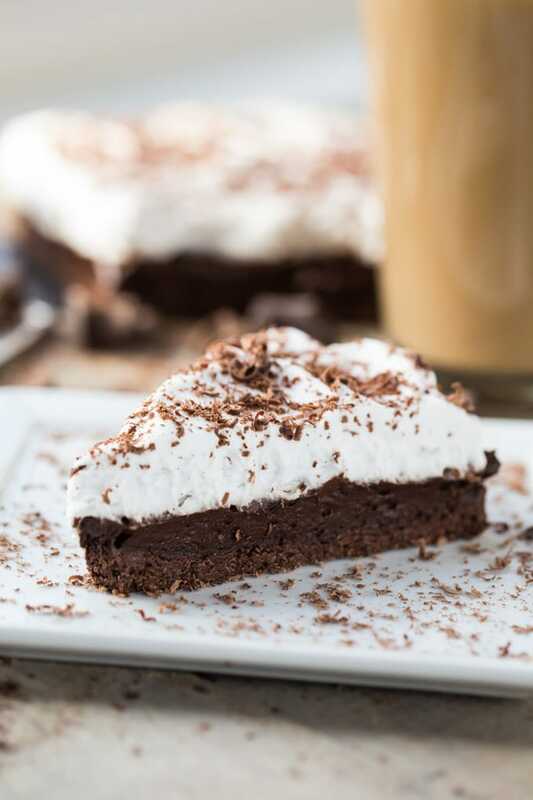 This year, I’m hosting our get together, so I’ll be whipping up a few Irish themed recipes, including this Dark Chocolate Irish Whiskey Tart for dessert. I may also try my hand at an Irish stew, and if I do, I’m definitely pairing it with this Rosemary Cheddar Irish Soda Bread by Nourish and Fete. Love the addition of fresh rosemary in this bread! It’s grain-free! The base is just a mix of ground almonds, cocoa, coconut sugar and coconut oil. It’s vegan! Yup, no dairy or eggs. The creamy chocolate filling is a combination of avocados, maple syrup, cocoa and, of course, whiskey. And it’s just topped with a super creamy whipped coconut milk. It’s a boozy dessert, so perfect for Paddy’s Day, or any celebration, really! 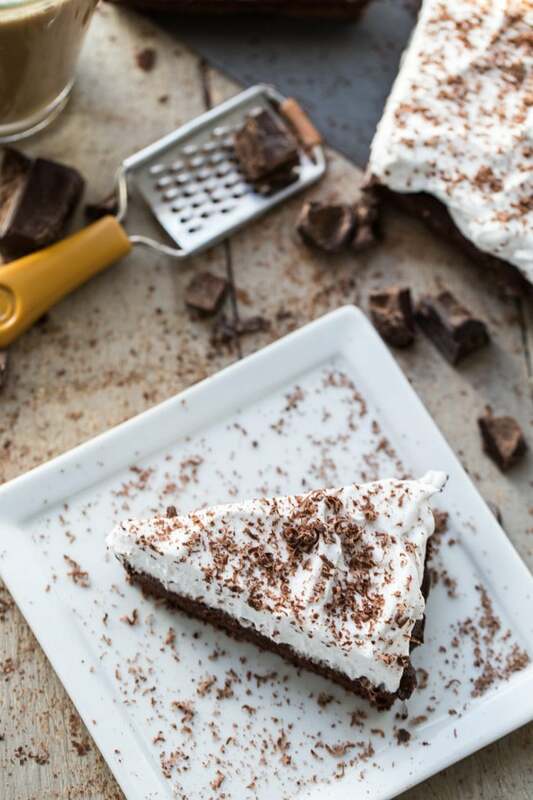 If you decide to celebrate with this Dark Chocolate Irish Whiskey Tart on the weekend, be sure to let me know what you think in the comments below! 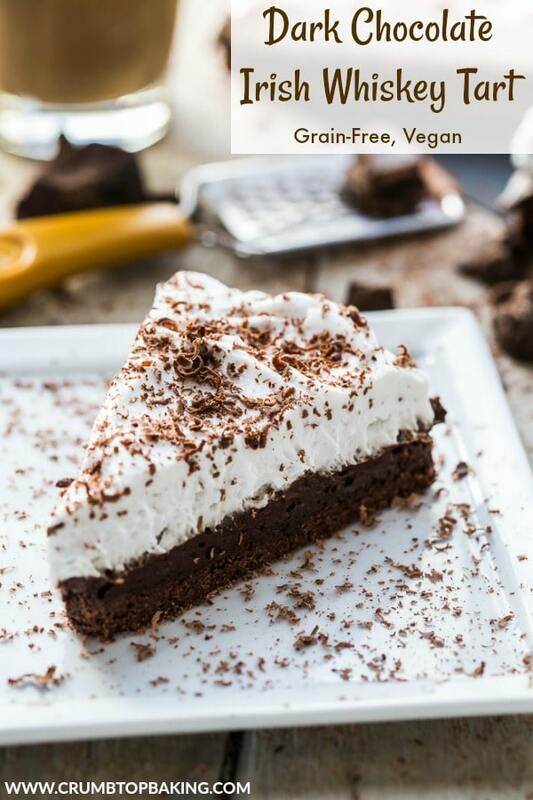 Dark Chocolate Irish Whiskey Tart is vegan, grain-free, and the perfect chocolate treat for St. Patrick’s Day! 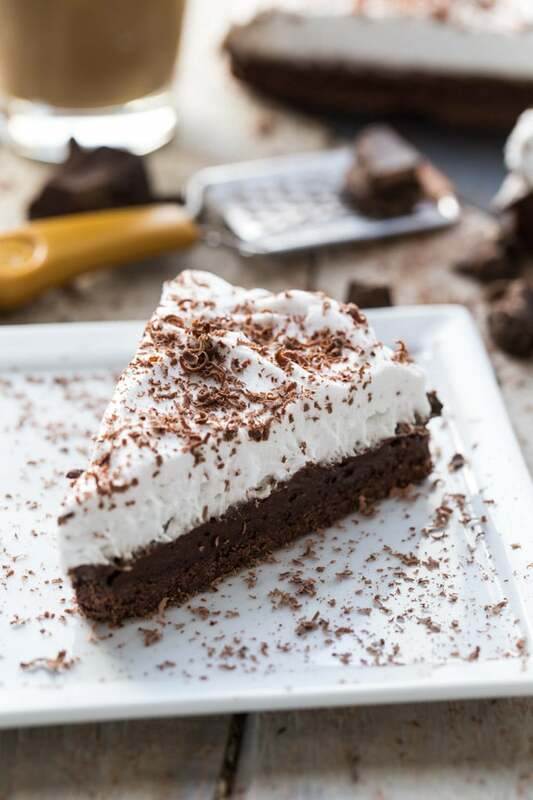 It has a ground almond crust, an avocado filling loaded with cocoa and whiskey, and a topping made with whipped coconut milk! Pre-heat oven to 350 degrees and grease a 14″x4″ rectangular tart pan. In a small bowl, sift together the ground almonds, cocoa and coconut sugar. Add the melted coconut oil and stir until well combined. Press the mixture into the bottom of the tart pan and bake for 8-10 minutes. 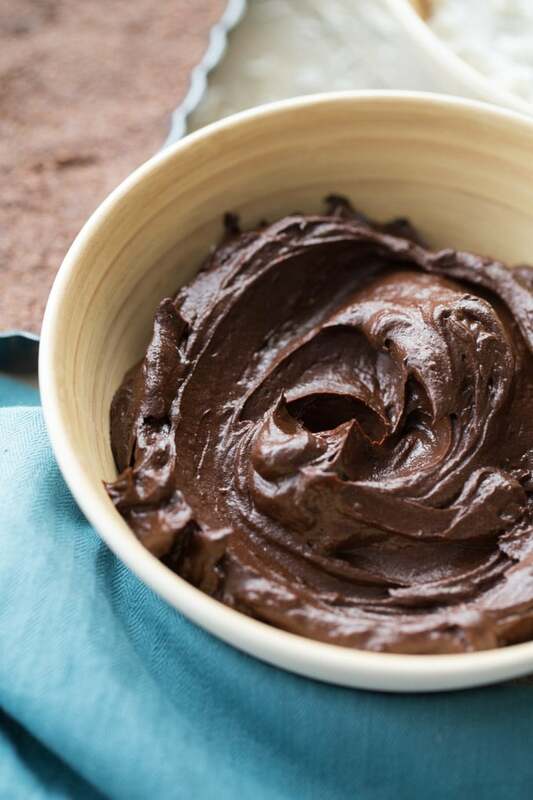 In a large mixing bowl, add the avocados, cocoa, maple syrup and whiskey and beat with an electric mixer on low speed until the cocoa is combined and then increase to high speed until the avocado is well blended. (I like to use my handheld mixer to do this). This will take about 3-5 minutes. 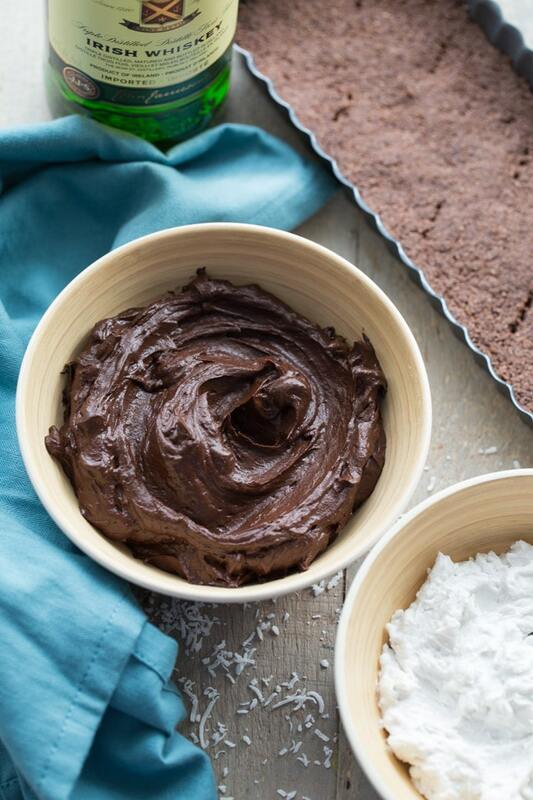 To minimize the cocoa dust, you can add the cocoa in small portions and beat after each addition. Spread the chocolate filling on the cooled crust and set aside. In a large mixing bowl, scoop out the solidified coconut milk from the two refrigerated cans and reserve the remaining coconut water for another use (like this smoothie bowl). Add the almond extract. Using an electric mixer, beat on high until the milk is whipped and creamy. This will take about 2-3 minutes. Spread the whipped topping over the chocolate filling. Top with shaved chocolate or toasted coconut and place in the fridge for an hour or two to set up before serving. Store any leftovers in an airtight container in the fridge. While this dessert will last 2-3 days in the fridge, it is best enjoyed the day it is made. If you like to prep ahead, you can always make the crust and chocolate filling the day before, and then whip up the cream and assemble the tart a few hours before serving. Looks yummy! As one of the attendees to your Paddy’s Day celebration – I can’t wait to try your creations. Mmmmmm this looks so decadent! And I think I could just eat that filling with a spoon! I may have ate a little bit along the way! Thanks Lisa! I honestly don’t do a lot on St. Patrick’s Day, except where silly glasses while staying home and vegging out. Ha! And I could totally go for a HUGE piece of this tart! Love all the flavours in here, Leanne. And I second, Lisa, above…I could eat that filling straight up. Have an awesome weekend! Thanks Dawn! Other than entertaining with lots of food and a few beverages at home, it was a pretty low key weekend! Hope you had a good one! Just give me the filling! I love how versatile avocado is! Haha! Thanks Patrick! Totally agree. Love the versatility of avacodo in sweet and savoury recipes! Haha! Thanks Ben. I’ve saved you a piece! 😉 I’ve never tried whiskey and maple syrup mixed with butter on pancakes, but that combo sounds like a delicious treat! I love baking with avocado. You should definitely give it a try some time! Thanks Katherine! I usually use avocado as a substitute for butter in frosting, so I was happy with how it turned out as a tart filling. As for snowstorms, I hope April brings warm spring weather for both of us! 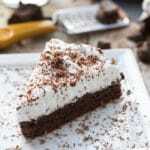 I love desserts that everyone enjoys, whether they follow a gluten-free or vegan diet, or not. And this is certainly one that’s a crowd-pleaser! It’s perfect not only for St. Paddy’s Day, but for any time of the year! Thanks so much Elaine! You can’t go wrong with a chocolate dessert! It’s a bonus that it’s grain-free and vegan! I’ll definitely be making it again before next Paddy’s Day! It looks so delicious! My hubby is such a fan of chocolate! I think I’ m gonna bake that « ohsodelicious pie » for his birthday tonight! Thanks Nathalie! Chocolate is always a popular dessert! Hope your hubby had a great birthday! 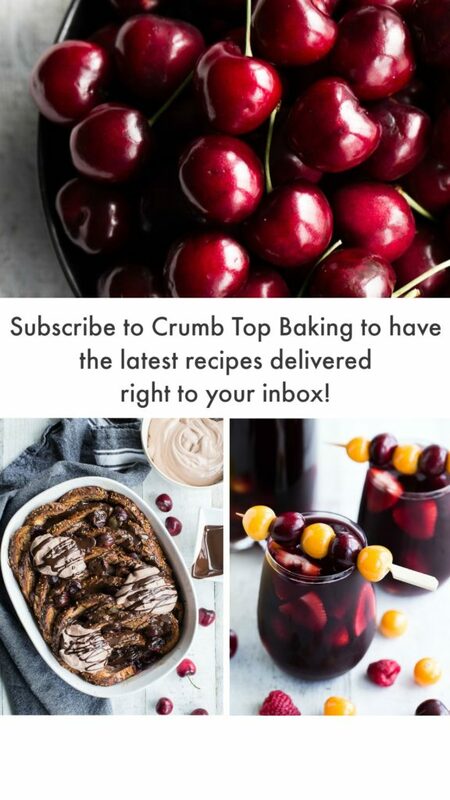 This looks and sounds oh-so-decadent! I don’t think I’ve ever had whiskey in chocolate cake before, but I can almost taste it just looking at that fluffy sponginess. Thanks Dana! The whiskey definitely enhances the cocoa taste in the chocolate filling! I clicked on the post because I was curious and figured I could easily veganize it, but now I don’t even have to! Thanks Aryane! I hope you get a chance to make it! I’m sorry, but did you just say DARK CHOCOLATE IRISH WHISKEY TART?!?! You literally just rendered me speechless. I’m sitting here, in a puddle of drool, trying to articulate my thoughts and feelings on this masterpiece you’ve just laid before us. Is there such a thing as Irish recipe awards? If so, I need to submit your recipe for consideration, STAT! I’m pinning the living daylights out of this post. Amazeballs, girl. Seriously now. Haha! Christina, you are just too funny! Thanks for pinning. I hope you get a chance to make it some time! I love boozy desserts, especially when they are as dreamy as the tart looks!! Pinned. Take care. Thanks Stacey! Boozy desserts are definitely a crowd pleaser, especially around Paddy’s Day! Thanks for pinning! I can’t believe we’re past mid March already…I’m in shock! We’re not Irish but we always have a traditional corned beef feast…your menu sounds delicious! This tart looks unbelievably good and it’s hard to believe that it’s vegan! This is just stunning Leanne! Thanks so much Marcie! Your corned beef feast sounds fantastic! Hope you enjoyed! OMG, this dessert! Everything about it is perfect. I’ve made avocado mousse before, but you added Whiskey! And your crust, and topping, beautiful! Can’t wait to try this. Thank you Colleen! The whiskey definitely enhances the cocoa flavour in the avocado filling! I hope you get a chance to try it! This looks incredible! May need to test it out this weekend! Thank Helene! Hope you got a chance to make it! This is the perfect Irish dessert recipe because it will appealing to all. Erin Go Bragh. Thanks. Thank you so much! Glad you like the recipe! So wish I had a slice Leanne! This looks so rich and chocolatey!! Well this is delicious!! Wish I had a big slice (or two 😉 )!! Thanks Puja! I hope you get a chance to make it. Be sure to let me know what you think if you do! Have a great week! Thanks Ashika! It’s definitely on the decadent side, but I’m totally enjoying avocado in baked goods! I hope you get a chance to make it! Haha, no worries Kelsie! If you lived closer, you could have dropped by on Patty’s Day to enjoy a slice. I made this tart so many times over the past few weeks, I must have ate an entire tart myself!